Among the local specialties in the Loire/Touraine area, we most enjoyed trying to keep straight rillons and rillettes. While traveling in the Loire Valley, we often saw menus featuring rillons or rillettes. I had heard of rillettes and thought it was similar to paté, but rillons were new to me. 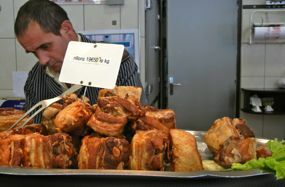 Traditional specialties of the Loire region (the Touraine), both are made of relatively fat pork, slow cooked until the meat is falling off the bones and tender. For rillettes the meat is cooked, shredded, and then remixed with fat, giving it a somewhat rough texture, perfect for spreading on bread. Rillons, in contrast, are actual chunks of meat, roasted very slowly until tender. They look a bit like slab bacon and are often eaten hot with potatoes. The best way to figure our what rillons really are? Order them! 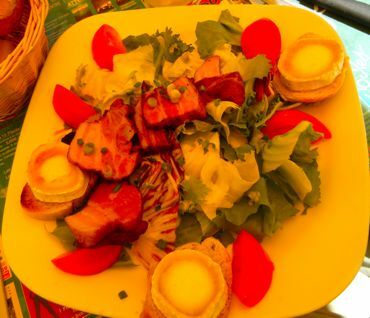 So in a restaurant in Tours, I ordered a salad with rillons and goat cheese. Quite tasty! Above, Rillons for sale in a charcuterie in Amboise, France. 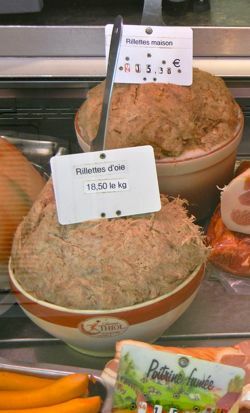 Below, Rillettes for sale near by.